Micronutrients are essential inorganic elements such as Magnesium, Zinc, Manganese, Iron, copper, Boron, Molybdenum and others. They are required only in trace quantities by plants. The soil cannot provide all the necessary micronutrients as they are gradually removed through weathering, leaching and other physiological activities. This has created a huge void in the supply of these essential micronutrients to crops. Micronutrients play a vital role in several physio-biochemical reactions taking place within the plant cells. Some act as co-factors to enzymes and help in enzymatic reactions, some help in the synthesis of various pigments such as chlorophylls, xanthophyll’s, carotenes etc. Several translocations of biological intermediates are facilitated through micronutrients. They are indispensible in the biosynthesis of basic building blocks of the cells such as the DNA, RNA & proteins. Their deficiencies can be easily identified in crops as it is manifested through various symptoms such as leaf yellowing, stunted growth, leaf, flower & fruit fall, spots on leaves etc. All these deficiencies can be corrected by either applying the necessary micronutrient complex as basal or foliar spray. Banana an important plantation crop, is sensitive to micronutrient deficiencies. Bark splitting, leaf crumbling, leaf discoloration etc. are various symptoms exhibited in diseased plants. Timely application of Ultra BOOST for Banana can prevent such symptoms and help plants regain their natural growth and vigour. This product is recommended as Basal application. 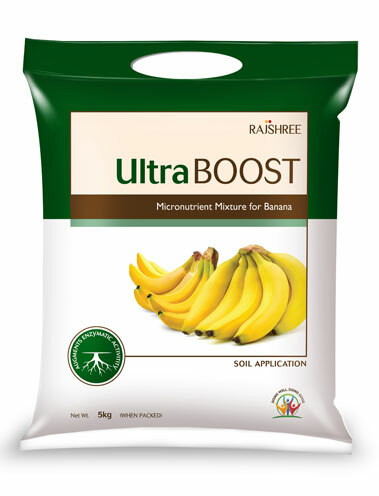 Ultra BOOST for banana is available in Tamil Nadu in 5 kgs pack. Paddy is an agriculturally intensive crop and has a great need for nutrients. Iron, copper, manganese, zinc deficiency result in leaf chlorosis, interveinal yellowing, stunted growth and decreased tillering while boron deficiency leads to rolled leaf tips, death of growing tips and increased spikelet sterility. 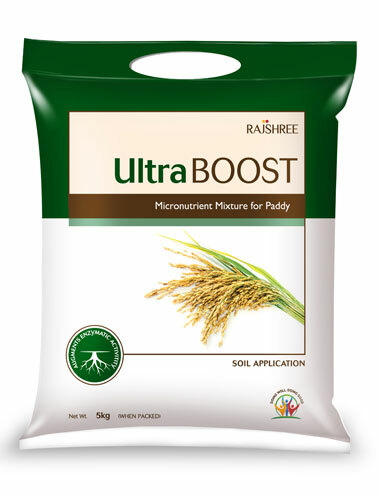 An immediate application of Ultra BOOST for paddy will help recover plants from all the above symptoms. This product is suitable for both Foliar and Basal Application. Micronutrients play a vital role in several physio-biochemical reactions taking place within the plant cells. Some act as co-factors to enzymes and help in enzymatic reactions, some help in the synthesis of various pigments such as chlorophylls, xanthophyll’s, carotenes etc. Several translocations of biological intermediates are facilitated through micronutrients. They are indispensible in the biosynthesis of basic building blocks of the cells such as the DNA, RNA and proteins. Sugarcane is an important cash crop grown in India. The yield is directly connected to the micronutrient levels in the soil. Essential micronutrients are required for proper sugar metabolism. Deficiencies lead to various symptoms ranging from leaf chlorosis, distorted leaf arrangement, slender stalks to low tillering and less sugar content. Application of Ultra BOOST for Sugarcane dramatically improves yield and sugar content in sugarcane. 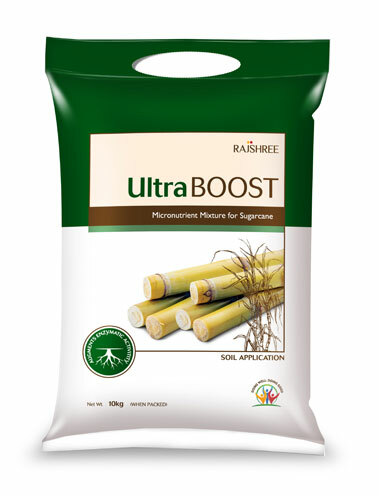 For your convenience, Ultra BOOST for sugarcane is available in Tamil Nadu in 10 kg packs. Ultra BOOST for Cardamom contains a combination of important micronutrients which includes Zinc, Ferrous, Manganese, Boron, Copper and Magnesium for providing uniform growth and increases yield. 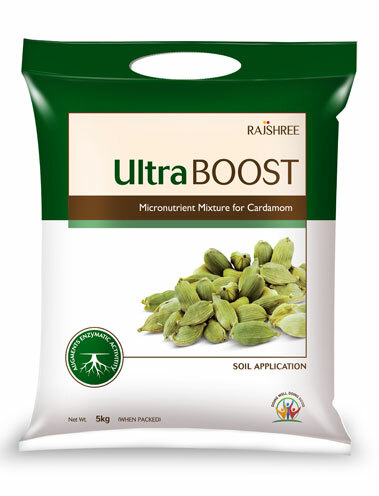 Ultra BOOST for Cardamom is available in Tamil Nadu in 5 kg packs. Ultra BOOST for Coconut contains a cocktail of recommended micronutrients such as Zinc, Ferrous, Manganese, Boron and copper. Ultra BOOST for Coconut is available in Tamil Nadu in 5 kg packs. 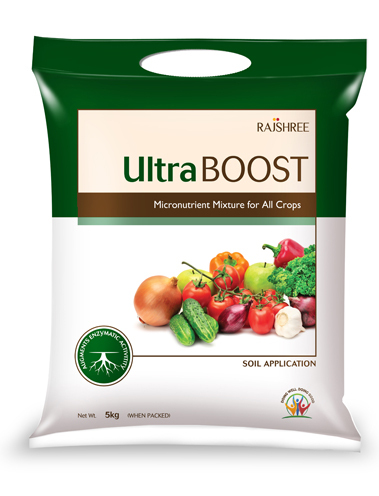 Ultra BOOST Formula 4 is an essential combination of Zinc, Manganese, Iron, Boron and Molybdenum for basal & foliar application in all crops to increase growth and yield. 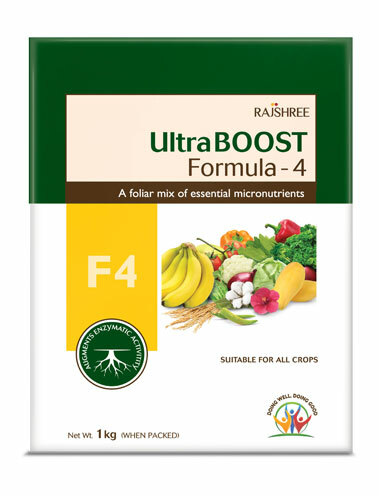 Ultra BOOST Formula 4 is available in Andhra Pradesh & Telengana in 250 gm, 500 gm and 1 kg packs. 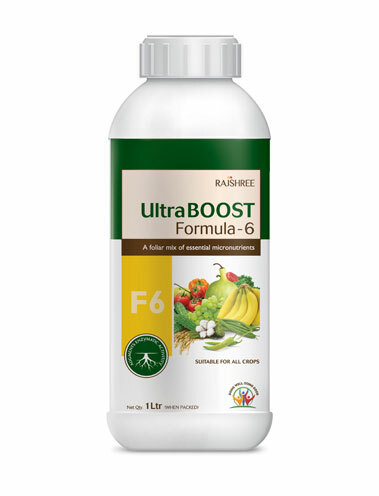 Ultra BOOST Formula 6 is a foliar mix of Zinc, Ferrous, Manganese and Boron for increasing growth and crop yield. Ultra BOOST Formula 6 is available in Andhra Pradesh & Telengana in 250 ml, 500 ml and 1 litre and 20 litre packs. Ultra BOOST BORON 20 contains water soluble Boron (20%) necessary for proper flower and fruit formation in all crops. Ultra BOOST BORON 20is available in Andhra Pradesh & Telengana in 250 gm and 500 gm and 1Kg packs. 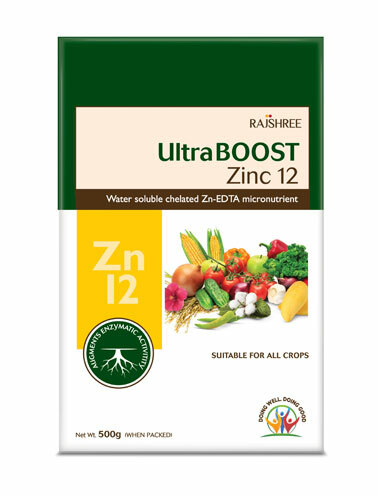 Ultra BOOSTZINC 12 contains Chelated Zinc as Zn-EDTA (12%) and replenishes plants with the necessary amount of Zn. Ultra BOOST Zn EDTA 12% is available in Andhra Pradesh & Telengana in 100 gm, 250 gm, 500 gm and 1 kg packs.